D. H. Timpko is the author of "The Firma Twins and the Purple Staff of Death" and "The Firma Twins and the Flute of Enchantment." A long time reader, she and her husband, who she met at a science fiction convention, own over ten thousand books. They also own over a hundred paintings and prints. They live in northern Virginia. 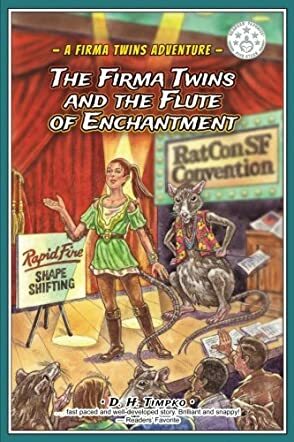 The Firma Twins and the Flute of Enchantment: A Firma Twins Adventure - Book 2 by D.H. Timpko is a unique novel that takes you on a journey and ensures that you will not put the book down until you have read it till the end. The story follows Electra Firma; she and her twin sister, Isis, are not completely human. They are part alien and they have to keep it a secret or else their future would be too grim to even talk about. But her real identity is now affecting her life. Thanks to her unique heritage, she has Olympic worthy ice skating skills, but her parents have banned her from even entertaining thoughts of such a career in the future. However, there are bigger things at play than she has any idea about. The future of humanity is under threat by aliens and it is up to her to pose as one of them so that she can find the elusive Flute of Enchantment. To get to that, she has to master her gifts and get inside the inner circle of these aliens. Her life is in danger, but she is not backing out. Not now, not ever! Is she strong enough to face off with an enemy that is far more powerful than she is? This is a fast paced and well-developed story. I really liked Electra; like her name, she had a spark that was undeniable. She was strong willed and hyper aware of her surroundings. She may be young, but her development was very strong. I liked the fact that she took charge, enlisted the help of a friend, and worked really hard to help others. This is really good! Brilliant and snappy!